ECGC PO Recruitment 2018 - Check here ECGC advertisement details for recruitment of probationary officer. 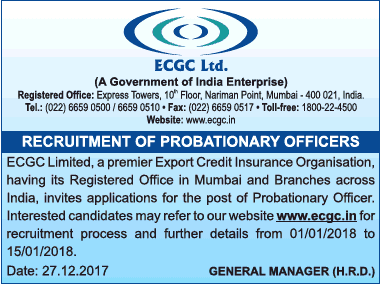 Export Credit Insurance Organisation, has released an advertisement for recruitment of ECGC PO 2018. ECGC has published Advertisement by the Times of India and as per advertisement news we can expect the official notification for probationary officer recruitment to be out soon. As Per the News advertisement given by ECGC in times of india, the ECGC PO registration process is expected to take place from 1st Jan. 2018 to 15th Jan. 2018. This is a bright opportunity for all aspirants preparing for banking or insurance sector job. Stay tuned here , we will update notification once we will get official.